Everyone loves a road trip, or taking a holiday to a fun destination. However, there is no feeling as refreshing and enjoyable as stepping back into your own home after a trip away. What if you could take that comforting feeling of home with you on the road? With a little bit of planning, you can. You can take the comforts of home with you on the road, and feel like you are in your comfortable, safe space during your stay in our luxury guest house in Graaff-Reinet. One of the best ways to guarantee a great stay at our luxurious guest house in Graaff-Reinet is to take something familiar with you on the road. It can be something as insignificant as your own hairdryer, or packing your own pillows. By having something familiar around, and not having to use the generic device offered by the provider of your holiday accommodation, you can have that sense of familiarity around you for when you might start to become a little homesick. The small things will make all the difference. A riveting novel to keep you occupied during your leisure time. These are only a few suggestions as to what to pack to make your stay at our Graaff-Reinet guest house even more enjoyable and memorable. Why choose Graaff-Reinet as your next destination? There are so many reasons! You will never be at a loss for things to do, whether you are just passing through or staying for longer. South Africa’s fourth oldest town will always welcome you with a friendly smile, ready to show you a great time. Flanked by the Camdeboo National Park, which is also home to the world-famous Valley of Desolation, Graaff-Reinet offers more than 220 fascinating heritage sites, along with many other attractions, such as art galleries and museums to keep you thoroughly entertained. What is more, there are exciting activities like wildlife game viewing, exhilarating nature walks, water sports, and many other attractions that will make sure you always have always something fun and exciting to get up for in the morning. These are only a few of the many reasons why tens of thousands of locals and foreigners book luxury guest house accommodation in Graaff-Reinet each year. If you are in search of an affordable and luxurious self-catering guest house in Graaff-Reinet, you have found it. Our recently renovated, 7-unit, private guest house is situated in the heart of Graaff-Reinet, among all the action and surrounded by famous tourist attractions. Book your stay well in advance to avoid disappointment, and let us welcome you to the Karoo way of life for a little while. We look forward to hearing from you. Why Should You Visit and Book Accommodation in Graaff-Reinet? Whether you are a history buff or nature lover, or you are just interested in experiencing the true Karoo life for a while, book your stay at our luxury Graaff-Reinet accommodation. There are so many reasons to visit this charming Karoo town, and experience everything South Africa’s fourth oldest town has to offer. With a history dating back to the late 1700s, Graaff-Reinet is one of the most celebrated Karoo “dorpies” in South Africa, with a richly beautiful heritage of its own. It is flanked by the world-famous Camdeboo National Park, which also hosts the famous Valley of Desolation. If you are keen, you can explore each one of the more than 220 heritage sites scattered throughout Graaff-Reinet, which is more than any other town in South Africa! These are only a few of the things that make Graaff-Reinet an exciting place to reconnect with yourself, while letting the kids run free in a safe, welcoming environment. Admire the famed Cape Dutch architecture of the Dutch Reformed Church, Stretch’s Court, and the Drostdy Hotel, among many others. After a long day of exciting activities and exploration, retreat to your luxury accommodation unit in our recently renovated guest house. Each of our units has its own private entrance, and is kitted out with luxurious bedding and linen. You have everything you need in your modern kitchenette to keep your family fed and hydrated throughout your stay, and you can look forward to indulging in a well-deserved bubble bath with the en suite bathroom facilities. Our luxury self-catering units are situated in the heart of Graaff-Reinet, making it even easier for you to reach any of the award-winning restaurants, museums, shops, and other tourist attractions in town. These are only a few of the attractions you can easily reach from KarooRus. 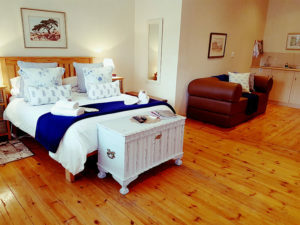 Other features of our accommodation include beautiful wooden floors, DStv channels to keep you connected to the world, and a warm, welcoming ambience from the moment you step through the door. Let us welcome you to the Karoo way of life. Book your stay at our Graaff-Reinet accommodation well in advance to avoid disappointment. If you would like more information, our team is always at hand to provide you with the advice needed to make your decision even easier. Contact us today to secure your booking.